BERLIN -- Volkswagen AG's global first-half deliveries exceeded 4 million cars and SUVs for the first time, powered by demand in all markets, the automaker said. Sales of VW's core brand rose 12 percent in the first six months of the year to more than 2.5 million vehicles, according to CEO Martin Winterkorn. 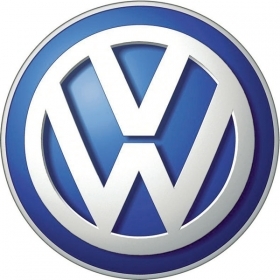 VW plans to release details of its top-selling brand's sales tomorrow and deliveries by Audi, Bentley, Lamborghini and the rest of the group on July 15. "Volkswagen continues to stay on the accelerator in all markets and vehicle segments," Winterkorn said Monday at a reception in Berlin. He predicted "good" first-half results. VW is counting on growth in Brazil, Russia, India and China to help surpass Toyota Motor Corp. as the world's biggest carmaker no later than 2018. The German automaker has forecast global sales will increase 5 percent this year after posting a record 7.2 million deliveries of cars, SUVs and vans in 2010. VW said last month it will expand third-quarter production of its Golf hatchback and Tiguan compact SUV at its main factory in Wolfsburg to meet strong orders. At the same time it will maintain reduced-shift production during workers' three-week summer vacation at two German plants and add several weekend shifts following the summer break. VW plans to invest 51.6 billion euros ($72.3 billion) in its automotive business over the next five years, with an additional 10.6 billion euros to be spent through its two Chinese joint ventures in the world's largest auto market. The automaker will hire more than 50,000 workers through 2018 to increase sales to more than 10 million vehicles. Winterkorn said Monday no decisions have been taken yet on plans by VW's luxury-car brand Audi to build a factory in North America, though "very intensive discussions" to that end are ongoing. Audi may build an engine and transmission plant which could be shared with the VW brand, Automotive News Europe reported Monday, citing unidentified company officials.